Roger Davis has provided 9 photos taken at the opening of the Great West Road, 30th May 1925, by King George V and Queen Mary. 'Brentford & Chiswick As It Was' includes more information about this major road project: the first by-pass of Brentford High Street. 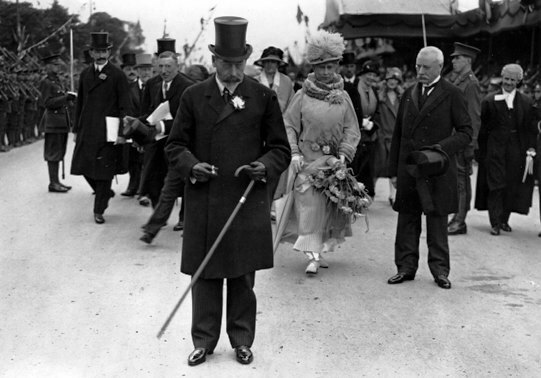 This photo shows a group of local dignitaries and Queen Mary following King George walking along the Great West Road. The London Gazette published a piece about the opening on Tuesday 9th June 1925 which mentions the Chairman, Aldermen and Councillors of the County Council of Middlesex: so would expect these gentlemen to be present at the ceremony and some of them to be included in the above photo. If you recognise anyone in this scene please get in touch.